It’s summer, obviously, and like it or not we’re all wandering around with fewer layers and more exposed skin. Cruelly, it’s also prime ice cream and barbecue season. Never fear! You can enter for a chance to win our Healthy Diet Makeover with chef and DudeFood author Dan Churchill. We’re giving away a chance to hear from Dan, star of MasterChef Australia and all-around clean-eating machine, about what essential, easy food swaps you may benefit from in your fridge or pantry. (Note: The winner will need to submit a photo of their food stash, and we’ll give it to Dan in order for him to come up with a healthy list of foods you should be eating.) The winner will receive, via email, his tailored diet recommendations, along with a sample one-day meal plan—including his personal recipes. 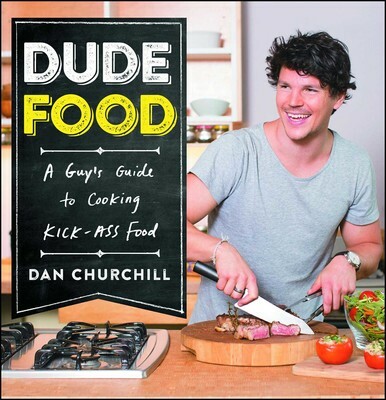 In addition, the winner will also receive a copy of DudeFood autographed by Dan. NO PURCHASE NECESSARY TO ENTER/WIN. Sweepstakes begins 6/29/15 and ends 7/31/15. Open to legal residents of any 1 of the 50 US or DC who are at least 18 years old. Void where prohibited by law. Subject to full Official Rules in Terms and Conditions above. Total ARV of all prizes: $500. Odds of winning depends on the # of eligible entries received. Sponsor: Simon & Schuster, 1230 Avenue of the Americas, NY, NY 10020. Meanwhile, here’s a great taste of what Dan’s got cookin’ this summer: Paleo Vegan Ice Cream!